From Mandarin orange chicken to spiced apple cider and organic ketchup, these are the most highly rated foods by Trader Joe's shoppers. Trader Joe’s certainly has a loyal following, as evidenced by the glowing reviews fans often give a plethora of their products. A new report from dunnhumby, a customer science data company, even ranked Trader Joe’s as the No. 1 grocery store in the U.S. based on consumers' emotional connections to the store as well as financial factors. In January, Trader Joe’s asked shoppers to weigh in on their favorite products through a public online poll. There must be something to highest ranked products below because it turns out that many Trader Joe's shoppers loved the exact same products as TODAY Show fans! Looks like Trader Joe’s fans have a hankering for Chinese food. This frozen staple once again was shoppers’ top choice for best product for the second year in a row. It’s always a tight race for the top title with Trader Joe’s Cookie Butter, which took the No. 1 spot in 2015 — and also made TODAY’s list of TJ’s items our staffers are obsessed with. 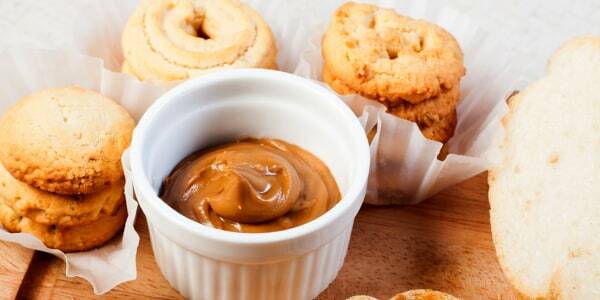 Cookie Butter was a runner-up all-around favorite this year. Trader Joe's version of the classic takeout meal, which has been popular with shoppers since its introduction in 2004, is a super easy-to-make dish that you simply pop in the oven to get the chicken crisp and then toss the pieces in the sweet and spicy orange sauce. You’ll find it in the freezer section, retailing for $4.99. A Danish treat was the winner for best bakery item at Trader Joe’s. This ring-shaped pastry with icing, made by O&H Danish Bakery, can be served at room temperature or slightly warmed. While only on shelves during the fall, the spiced cider still beat Brewed Ginger Beer, sparkling mineral water and Triple Ginger Brew as customers’ go-to drink. Made specially for Trader Joe’s, the cider blends cinnamon, allspice and clove flavors with no added colors, sugar, artificial flavors or preservatives and sells for $2.99 for 64 ounces. You told TODAY Food that you loved this cheese and, once again, it took home top cheese honors among TJ’s customers. A bestseller since its introduction in 2011, Trader Joe’s describes Unexpected Cheddar as tasting like an aged cheddar with a "surprising flavor turn" and recommends it with a glass of Rose, Pinot Noir or a pale ale. The market is saturated with coffee products these days, but this tried-and-true staple has been a hit with TJ's fans since was it first hit the market. This type of coffee is never heated, giving it a more “lush and fruity” taste, says Trader Joe’s on its website. Since it's a concentrate, it's quite strong so you can simply add water or milk to serve. The coffee comes in 32-ounce bottles for $7.99, which sounds steep for brewed coffee but it can really make about 96 coffee beverages when diluted. Forget Heinz. This top condiment, also a favorite among TODAY Show fans, bypasses artificial ingredients and additives and costs $1.99 for 24 ounces. Customers went gaga over Greek food with their favorite frozen appetizer, voting spanakopita No. 1 in this category. A spinach and cheese pie made with filo dough, TJ's spanakopita is actually made in Greece and is pie shaped so it’s easy to cut. Totalling just 70 calories per cone, this frozen dessert is a hit with shoppers. Each wafer cone is filled with vanilla ice cream dipped in chocolate and costs only $2.99 for a box of eight. It’s no surprise that mandarin orange chicken also topped the favorite frozen entree category. Other top honors were given to Joe’s Diner Mac ‘n Cheese, Chicken Tikka Masala, Hatch Chile Mac ‘n Cheese and Kung Pao Chicken. Easy to grab on your way out the door, the black bean and jack cheese burrito is a flour tortilla filled with seasoned black beans and Monterey Jack cheese that you can reheat in an oven or microwave. Each burrito is $2.99, making it a much cheaper option than something you'd find at a fast casual restaurant. Looks like both carnivores and vegetarians really, really like one type of speciality sausage. Shoppers picked soy chorizo as their favorite meat or meat replacement protein. The Trader Joe’s rendition of Mexican sausage, available for $1.99 for 12 ounces, has soy protein and the same spices, like paprika and garlic powder, used to make traditional chorizo. How can you go wrong with bananas? Healthy, cheap and portable. Voters agreed, giving this yellow fruit a big thumbs up. Trader Joe's customers also really liked avocados (both regular and teeny tiny sized), Brussels sprouts, and the ever-popular riced cauliflower. When it comes to snack time, Trader Joe’s fans are most likely to reach for a handful of peanut butter pretzels, available in a pound bag for $2.99. The snack is apparently also a big favorite among TJ's employees, according to the store’s website. Trader Joe's makes a lot of pumpkin-flavored things — let's face it, even though it's everywhere, we do still love pumpkin spice! But voters kept it simple with their top pumpkin pick, choosing the grocery chain’s organic pumpkin as their top pumpkin product. Pumpkin butter, ice cream, and mixes for pumpkin bread, pancakes and bread were all runners-up. TJ’s organic pumpkin also made TODAY’s list of healthy Trader Joe’s items we love.